I visited friends with brand new baby twins last weekend, which meant I arrived at their house bearing food and lots of it. A quick perusal on Pinterest found me 2 great new recipes to try out from the same blog. Hit a home run with both and look forward to making them again from time to time! First up, a 7 Layer Greek Hummus Dip. Hello. As is the case with most multi-layer dips, I assume, the most time consuming part of this recipe was chopping up the veggies. From there it was pure simplicity. The bottom layer of cream cheese mixed with lemon juice, garlic and italian seasoning was followed by an 8oz package of store bought garlic hummus. Tomatoes, cucumbers, red onions and kalamata olives were chopped up for layers 3-6. Finally, feta cheese was sprinkled over the top - some may say an excessive amount was used, I say it was just right. I don't have a great shot of the seven layers because of the type of dish I prepared this in (my "meant to travel" tupperware is opaque at best.) But you need to check out the photos from the recipe's blog, Creme de la Crumb. Yum. I actually stumbled upon the Greek Dip after first visiting the blog for this amazing Chicken Salad recipe. Now, I already have 2 great go-to's for Chicken Salad that I've been making for years. The first involves dill, ranch dressing, avocados, cashews and swiss cheese. And bacon. The second involves celery, grapes and a healthy dose of poultry seasoning. But this one featured a couple words I've been making more of an effort to include in my diet lately: "skinny" and "fat free." I doubled the recipe to serve enough for our party of 4 and still have a bit leftover for the proud parents. The Skinny Chicken Avocado Salad started with garlic powder, seasoned salt, sugar, dijon mustard, mayo and yogurt in a bowl. 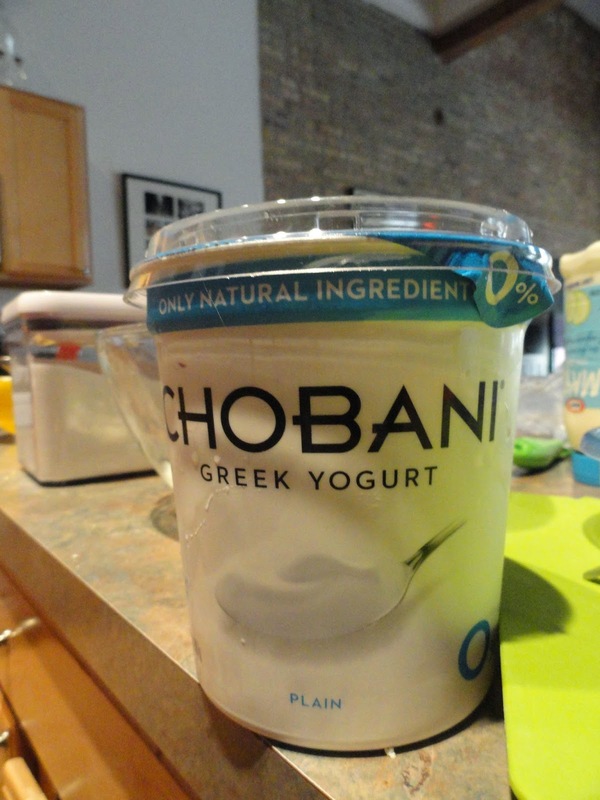 I bought my first Chobani for this recipe and now we have a fridge full of it thanks to a sale at the grocery store. The husband is hooked, and I think I may be too! Add a little bit of honey, some granola. . .baby, you got a treat goin' on! After the yogurt and mayo were mixed in, the diced celery and green onions were added next. I used my KitchenAid mixer paddle trick to shred up the chicken and once added I had enough for about 6 sub-roll sandwiches. I waited to dice up the avocados until I was preparing lunch so that we didn't have brown-ness on our hands. I actually made this recipe a few days later for ourselves, but diced the chicken instead of shredding it. I gotta say, I prefer the shredding to help keep the salad together and "in" the sandwich! Since the chunks of avocado are also of a good size, adding diced chicken to the mix just made it all the more fall-aparty. So there we go - 2 new recipes to keep in the rotation, just in time for summer picnics! Be sure to check out the source blog for complete recipes. What are you making for your next barbeque?